An 8-inch hydrogen valve and a suspect position sensor in the shuttle Discovery's engine compartment that appeared to malfunction during fueling Tuesday, forcing NASA to scrub an early Wednesday launch, performed normally during five open-close cycles Wednesday evening, officials said. The tests, carried out after Discovery's external tank was drained of rocket fuel, gave engineers added confidence the valve is not broken or on the verge of failure. But it does not yet explain why a position sensor failed to indicate the valve had closed properly during fueling Tuesday. Additional fuel line pressure decay tests were being carried out late Wednesday, but barring an unexpected result, the launch team planned to resume Discovery's countdown at 8:57 a.m. EDT Thursday for a possible launch attempt at 12:22:09 a.m. Friday. But that assumes NASA's Mission Management Team, scheduled to meet at 1 p.m. Thursday, finds no fault with the test data and approves a formal waiver to launch Discovery as is. Agreement on a waiver presumably would be based on a detailed engineering review and confirmation the valve's position could be indirectly verified during the final stages of the countdown. Assuming the MMT opts to proceed, engineers will begin refueling Discovery at 2:57 p.m. Thursday. The astronauts - commander Rick Sturckow, pilot Kevin Ford, Jose Hernandez, John "Danny" Olivas, Patrick Forrester, European Space Agency astronaut Christer Fuglesang and space station flight engineer Nicole Stott - would begin strapping in around 9:02 p.m.
During fueling Tuesday for a planned 1:10 a.m. Wednesday launch, readings from Discovery's inboard liquid hydrogen fill-and-drain valve indicated it failed to fully close on command when the shuttle's external tank was nearing a full load of propellant. Engineers quickly focused on the position sensor, part of a valve actuator system, as a possible culprit and not the valve itself. 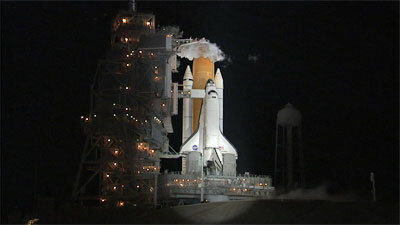 But to find out, they had to wait for Discovery's tank to be fully drained and "inerted" late Wednesday afternoon. The valve cycle tests, using both the position sensor and indirect methods to confirm the state of the valve, began at 6:28 p.m. and concluded after five runs at 6:59 p.m. The sensor indicated normal valve operation, as did indirect helium pressurization readings. "In all five tests, the valve opened and closed as designed," said NASA spokesman Allard Beutel. But the tests Wednesday were carried out under ambient conditions and it's possible the sensor was affected by supercold cryogenic conditions during fueling Tuesday. But as of this writing, the anomaly remains unexplained. A scheduling assessment early Wednesday showed the fly-as-is option was the only approach currently under discussion that gives NASA a chance of getting Discovery off the ground before its current launch window closes Sunday. Window considerations aside, replacement of the position sensor and actuator would delay launch to Sept. 3. Replacement of the valve would push launch to around Sept. 5, according to an initial schedule outlining all three options. But Discovery's current launch window only runs through Sunday, Aug. 30. The Air Force Eastern Range, which provides tracking and telemetry support, is unavailable from Aug. 31 through the next several days because of an unidentified, presumably military operation. Assuming nothing changes on that front, Discovery's crew then would have to wait on upcoming Japanese and Russian space station missions. As it now stands, the next shuttle launch opportunity after Aug. 30 is around Oct. 17. The shuttle is equipped with four propellant fill-and-drain valves: inboard and outboard liquid hydrogen valves and two corresponding liquid oxygen valves. When the shuttle is loaded with fuel before launch, the liquid hydrogen and oxygen propellants are routed through launch pad tail service masts on each side of the shuttle, into the engine compartment, through the main engine plumbing and into the external tank. The fill-and-drain valves are closed before launch and then opened in orbit, after external tank separation, to rid the engine lines of residual propellant that may be trapped in the system. The valves also must be opened to drain the external tank if a launch is delayed. The inboard fill-and-drain valve must be operational and confirmed closed before launch. NASA flight rules forbid cycling the valve for troubleshooting once fueling has started and the hardware is in a supercold cryogenic environment. The concern is that additional cycles could contribute to an existing problem, possibly causing galling and creating debris that could cause the valve to break or get stuck in the closed position. Testing the valve in ambient conditions puts less stress on the hardware.